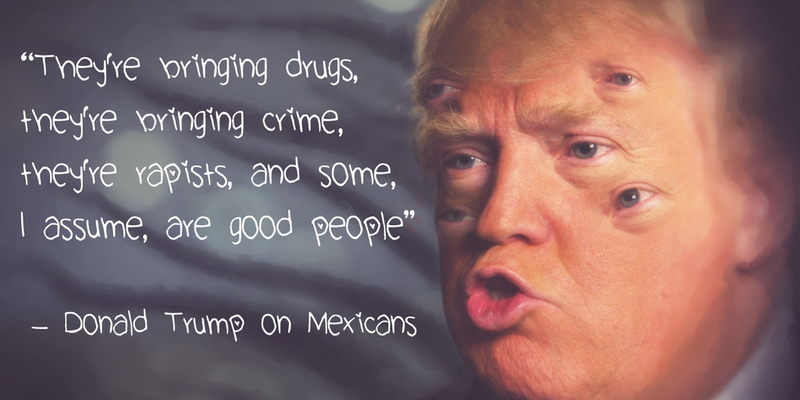 The presidential candidate and professional assclown called Mexican immigrants "rapists." This isn't the end of me and Greendale. Community was my world for four seasons and my job for three, and has hold of my whole heart like a bad-news high school boyfriend. I'll never really get away. The chemistry is too perfect and the writing room couches aren't really that uncomfortable to sleep on and I just can't stop writing for Britta. Plus I still have to do my editing pass on the finale. Rumor: Jimmy Fallon to take over The Tonight Show in 2014? The first-ever convention celebrating Community is taking place in February! What's one of the most fun benefits of taking a show about local politics national? Cameos! Parks and Recreation has taken such a turn this season, with Adam Scott's character, Ben, taking a job on Capitol Hill. 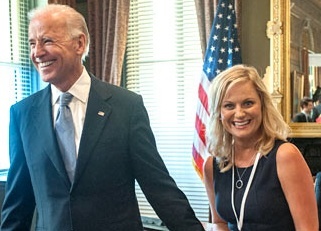 And Ben will be responsible for bringing a very recognizable gentleman to meet his fiancée, Leslie Knope, played by Amy Poehler -- Vice President Joe Biden! Fresh off of re-election, Biden -- an object of Knope's affections -- will make a brief cameo at the beginning of the episode airing next Thursday, November 15 at 9:30 PM (Eastern). This year's season premiere featured appearances by Senators Olympia Snowe, Barbara Boxer, and John McCain, so Parks and Recreation is clearly the place to be if you're a politician reminding people that you have a sense of humor or you're taking a victory lap. (If Paul Ryan had been the VP-elect, he obviously would have been in last week's episode. He's that fast!) Entertainment Weekly has clips. This kind of thing is usually reserved for sweeps week, but it's not a stunt: NBC's single-camera comedy Up All Night, starring Will Arnett, Christina Applegate, and Maya Rudolph, will be changing mid-season to a multi-camera format with a live studio audience. It's not even the first huge change the show has seen in its second season; the premise last year involved Applegate's character working for Rudolph's talk show, Ava, while Arnett's character took on the role of stay-at-home dad. 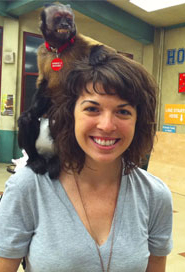 This season, Ava was canceled, Arnett went back to work, and Applegate is now a stay-at-home mom. Okay, acceptable to flip a storyline on its head to change things up. And now, it will be an entirely different show. The show will run through December, fulfilling its original 11-episode order as a single-camera show. In February, it will return to production for five more episodes as a multi-camera show. This was all based on an idea by executive producer Lorne Michaels, who thought this might be a good idea based on the strong performances by Applegate and Rudolph when they (separately) hosted Saturday Night Live. While everyone is enthusiastically awaiting the return of NBC's Community this fall, news broke today that the network was delaying its fourth season premiere indefinitely. Now, when I first read this, my first thought -- and many probably thought the same -- was that NBC was screwing over Community, yet again. But, as it turns out, it's the total opposite. Instead of just taking it off the schedule, launching it into further obscurity so it can die a quiet death, the network wants to put the proper spotlight on it and spend more time marketing it. NBC released a statement saying that their current lineup of new shows is benefiting from their attention, so they've chosen to shelf the premieres of both Community and Whitney, which were originally going to premiere next Friday. "Without having to launch these comedies on Friday at this time, we can keep our promotion focused on earlier in the week; plus, we will have both comedies in our back pocket if we need to make any schedule changes on those nights. When we have a better idea of viewing patterns in the next few weeks, we will announce new season premieres of Whitney and Community." NBC is taking advantage of its Olympics coverage by promoting its new fall and late summer shows. 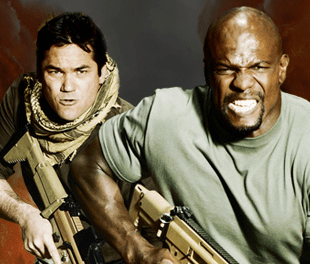 A particularly unnerving one is for a show called Stars Earn Stripes, a new reality/competition show hosted by former presidential candidate and Army general Wesley Clark that takes D-list celebrities and puts them through very realistic military exercises with real military personnel. Almost every single part of that sentence felt weird to type, but it gets even more uncomfortable when you realize that NBC was essentially plucking (or, rather, reaping) semi-famous people from their relative obscurity and making them engage in combat with each other -- not unlike The Hunger Games, which are not supposed to be real. And even though the contestants don't have to actually kill each other, the idea is to see who can perform on the same level as a soldier of the U.S. military by making them go through the same exercises as the actual U.S. military. The military is entertainment now. Entertainment is the military. Welcome to Idiocracy! It finally, actually happened. In an incredibly disheartening interview with Time Magazine, NBC Entertainment chief Robert Greenblatt has announced that in light of the low ratings for uniquely creative and fun shows like Community, the network will focus on making "broad" sitcoms in an attempt to grow its audience. Because what's the point of making good TV shows if no one is watching them, and why not just make tons and tons of unfunny shows that people will watch and then forget about? Good strategy, NBC.